Last week the confidence in the Federal Reserve Chairman cracked publicly as he committed the unpardonable sin of admitting he is afraid of the mushrooming U.S. Federal government debt. While government officials have a traditional mantra of instilling public confidence and encouraging investor calm in the increasingly dangerous debt pile, Powell broke ranks and dared to share his candid feelings on the subject. It is yet another reason for you to take immediate and significant action to protect the value of your investment and retirement portfolios from the looming federal government insolvency. Gold makes sense in an IRA as it has since the ancient world precisely because it protects and safeguards against financial malfeasance and runaway debt. Now might be a good time to consider the Top Gold IRA and Bullion Companies for 2019 while you still can. Federal Reserve Chairman Powell's comments rarely come from a vacuum. The yearly American federal deficit just topped a sustained all-time high over $1 trillion. This significant benchmark has a great number of economists fearful it will mean serious trouble for upcoming generations stuck with the bill coming due on their watch. In the past, these annual deficits have occasionally exceeded a trillion. This is a disturbing first time that it happened in a prolonged period of respectable economic growth as seen today. It has only sparked fears of what will occur should a damaging recession hit now or going forward. The public and American investors own around $16 trillion of this. Yet with interest rates dramatically rising under Chairman Powell, the soaring interest cost on total debt is quickly evolving into a larger and more cumbersome economic burden with every passing month. Is the Federal Reserve Actually Hellbent on Fiscal Suicide? Some would argue that this is precisely the wrong time to be raising national interest rates that dramatically impact the debt servicing totals of the federal government's debt pile. Yet it is exactly what the federal reserve is busy doing. One Wall Street investor known as the bond king, the legendary financial prognosticator Jeffrey Gundlach warned back in December that the Federal Reserve board really appears to be running such a “suicide mission” with upping the rates even as the federal deficit as a percentage of national GDP is dangerously on the rise. This is generally the time that the Federal Reserve lowers interest rates historically. Gundlach is also concerned about an economy that seems to be slowing down at the same time. This could cause the “supply to make it so rates do not go down with economic weakness.” Meanwhile, Fitch Ratings is enjoying kicking the government while it is down. This past Wednesday, the ratings agency warned that the continuing government shutdown is serious enough it will shortly affect the federal government's capability of passing a budget, leading to a dramatic negative impact on the government's all around AAA-rated sovereign debt ratings. Some might dismiss such fears of the debt servicing overpowering the federal government's budget as scaremongering or overblown reactions. Yet a growing number of analysts from Wall Street are now inclined to think that the added debt from the $1.5 trillion in tax cuts has hurt the slowing economy as well as the federal government's finances overall. The outlook for U.S. economic growth has even been slashed to two percent for 2020 in no small part because of the new phenomenon of rising interest rates. It is now clear that the federal government increasingly will be increasingly forced to divert a larger and larger share of its annual revenue to servicing the incredibly mushrooming national debt. Rather than applying to spending for the economy, this budget will increasingly flow to pay foreign creditors of the U.S. (like China and Japan) while also enriching the coffers of those domestic investors holding Treasury bonds. This is exactly the opposite of fiscal stimulus, having a net tranquilizing effect on the economy. In fact, legendary former Merrill Lynch Chief Strategist Rich Bernstein warns that the economy is running well below capability in growth terms because of the surges in the federal debt and the rising costs in interest for servicing it. This has led to what he calls noticeable declines in the annual average economic growth rates. As an example, only since President Trump took office two years ago this month, the total national debt has risen by a dramatic $1.8 trillion to reach over $21.7 trillion in total. Treasury has been forced to borrow a greater amount in order to pay for the federal government's rising budget deficits. They have only worsened over the past two years as the administration increased spending all the while slashing taxes. Projections from the CBO Congressional Budget Office make the picture appear still worse. They forecast that the nation's debt will grow to the tune of another $5.8 trillion in just the coming five years to touch $27.5 trillion. Bernstein warns that this increasing debt load will become a greater black hole increasingly draining the annual budget of the United States. More than the rising debt, it is the devastating but inevitable impact of higher interest rates that are massively compounding the terrible increase in the borrowing costs of the federal government. For the fiscal year ending in September 30th, the net interest payments on the federal debt increased by an eye-watering 20 percent to $371 billion for only the year. Yet this terrible trend has only just begun. The CBO now estimates these yearly figures will about double in only five years to reach $702 billion in debt servicing annually come 2023. This would bring the yearly debt payments higher than the $493 billion in current required expenditures for Medicaid. It would mean that the interest on debt surpassed the $679 billion spent on national defense, which today is still the biggest category of non discretionary expenses in the U.S. government's annual budget. In layman's terms, this means that the once-academic debate on the federal debt and deficit is no longer going to be the purvey of economic think tanks, university classes, or political and financial chat rooms. It is soon to be coming to a theater near you. Now is the time to take dramatic notice and action yourself. Today is the time to start considering the Top Five Gold Coins for Investors and the Top Five Silver Coins for Investors. You should also be looking seriously at the Gold IRA Rollovers verses transfer options while there is still time to get this more flexible form of Gold IRA established. 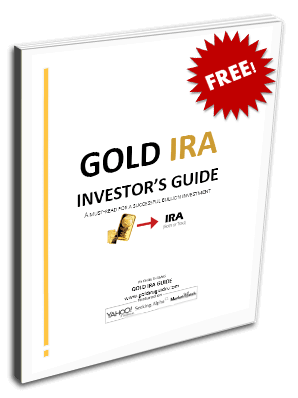 Do not wait until it is already too late to take effective action with IRA-approved gold.